Frances Gray Patton (1906-2000) said that she could hardly remember a time when she didn’t consider herself a writer. The daughter of a journalist, she was born and raised in Raleigh, North Carolina. Her parents read so much to young Frances and her two brothers that they always felt most comfortable with a book in their hands. She had her first success as a writer when, in high school, her short story won first place in a national contest. She continued writing while she attended Trinity College (now Duke University) and later the University of North Carolina – Chapel Hill, where she was an active member of the Carolina Playmakers. 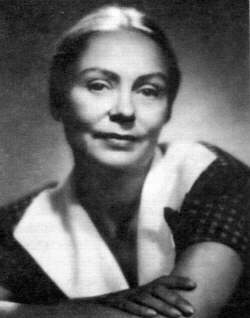 While she was a student at UNC, she wrote a play, The Beaded Buckle, and later received a Playmaker Fellowship for her acting. In the years following her marriage to Dr. Lewis Patton, a professor at Duke University, she focused her energies on raising their three children, a son, Robert Gray, and twin daughters, Mary MacRae and Susannah Garrison. As her children grew older, she began writing again and submitting stories for publication. An early story, “A Piece of Bread,” published in The Kenyon Review, won second place in a national competition and was included in the 1944 O. Henry Memorial Award Stories. Her best known work, the novel Good Morning, Miss Dove, expanded from a short story entitled “The Terrible Miss Dove,” appeared as a series of short stories in The Ladies’ Home Journal. The collected tales of an eccentric North Carolina schoolteacher and her students won the Sir Walter Raleigh Award for the best work of fiction as well as the Christopher Award in 1955, and became the basis for a popular movie of the same name. Despite the success of this novel, Mrs. Patton’s first love was always the short story. Her stories appeared in numerous anthologies and magazines, primarily in The New Yorker. A collection of her short fiction, The Finer Things of Life, was published in 1951 and in 1953 won the annual Sir Walter Raleigh Award for the best fiction published by a North Carolinian. She won the award again in 1956 for A Piece of Luck, published in 1955. While continuing to write, Mrs. Patton also inspired many young writers, teaching creative writing at Duke University, the University of North Carolina – Chapel Hill, and the University of North Carolina – Greensboro. She was awarded the North Carolina Award for Literature in 1970 and in 1990, the R. Hunt Parker Memorial Award for lifetime contributions to the literary heritage of North Carolina. Buy the play from Samuel French. Check out the IMDB page for the film version of Good Morning, Miss Dove.